Akit's Complaint Department: A Bay Area Gas Tax or Fee to Benefit Public Transit? A Bay Area Gas Tax or Fee to Benefit Public Transit? 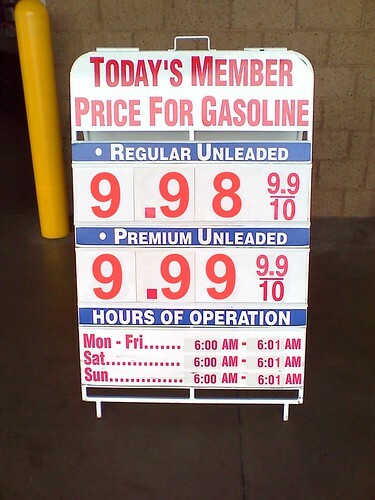 We all know the facts about buying gasoline, we are practically the most expensive in the country. But we also know that Governator Arnold has been taking away tax money earned through the taxing of gasoline that was supposed to fund public transit, but instead been used to offset the state budget deficit. Because of the siphoning, transit agencies took a big hit on their funding source from the state. An interesting article came from the Chronicle this morning about the local transit officials getting back their transit funding from the state, but what really struck me was a regional tax or fee dedicated to transit. That sounds like an interesting concept. Add a few more cents per gallon to allow more funds to be dedicated solely to public transportation for our region only. Regardless if you buy gas in San Jose or Marin, you know that just a few pennies per gallon is helping to provide much needed public transit for everyone. But... the MTC did say that there is a difference between a "tax" and "fee." In order for a tax to pass by voters, it needs at least a two-third majority, but if it's just a fee, it only needs a simple majority (50% plus one). I think there should be some big restrictions to the money being raised: They should propose that this tax/fee can never be used for other purposes than public transportation. There will be no siphoning it to fix highways or bridges, just for the transit agencies. Maybe also make a rule that the money cannot be used to pay for salaries. Just because you get an extra several million dollars doesn't mean employees and unions can abuse that money to their advantage by demanding higher salaries, bonuses, or expensive overtime. Remake of KTVU's "Bay Area People" Commercial? Is it Time to End SF's Recycling Centers? Bad San Francisco DPW... Go to Time Out! Comments to Author of: "Burn Your TransLink Card"